Marinate tofu overnight in Korean barbecue marinade. Broil or barbecue the beef. Pour 1/2 - 1 teaspoon of sesame oil in the base of each stone bowl. Divide rice between the 4 stone bowls. Arrange all ingredients on top of the rice side by side around the bowl. Put a teaspoon (or more depending on taste) of the Korean chili paste on top of the vegetables and in the middle of the bowl place an egg yolk. Pour a tablespoon of sesame seed oil around the edge of the bowl. Place stone bowl on top of stove and on high heat leave for approx 5 minutes or until you can hear the rice popping and crackling. Remove from heat and serve. Be very careful as the stone bowl will be extremely hot. 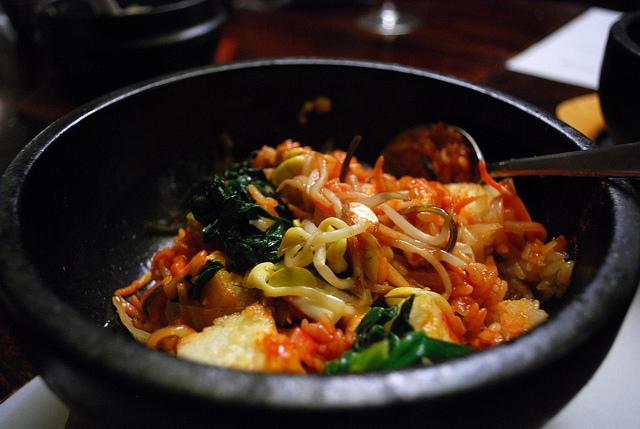 Thank you for de-mystifying bibimbap...what a great recipe! 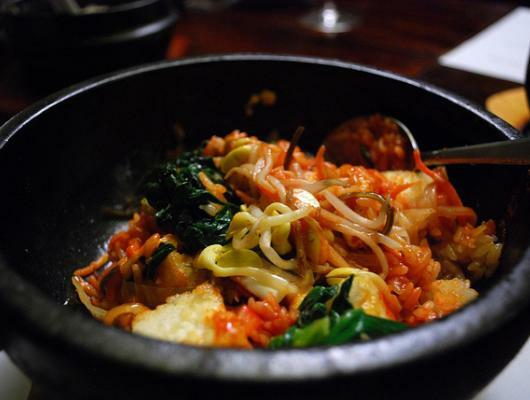 Dolsot bibimbap is a classic Korean dish of rice, meat (optional), vegetables and egg that is served bubbling hot in a stone bowl (dolsot).